Bankrobbers Bonnie and Clyde met their end 75 years ago May 23, ambushed by police officers outside Gibsland, Louisiana and shot to death. 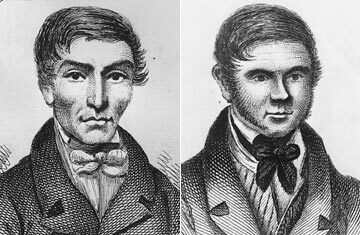 TIME takes a look at more of history's most notorious crime duos. The study of anatomy became exceedingly popular during the 18th century, and colleges like the University of Edinburgh, limited by a law issuing schools only a single cadaver a year, were plagued by an insufficient amount of legitimately available corpses to meet the demand. The resulting pressure from growing student bodies caused surgeons to become less discerning about where they got their materials, and to ask fewer questions when they were procured. Grave robbing  and more sordid behavior  grew increasingly prevalent. William Burke moved into William Hare's lodging house in 1827. When a customer that still owed rent to Hare died at the end of the year, Hare collected by selling his corpse to the Edinburgh Medical College for a profit. Encouraged by the money, the duo eventually killed and sold 17 victims for dissection before they were caught. With a lack of overwhelming evidence, Hare was offered immunity from prosecution in return for testifying against his partner. Burke was found guilty and his subsequent hanging drew one of the largest crowds of spectators in Edinburgh history. Appropriately, his body was publicly dissected at Edinburgh Medical College, where his skeleton, death mask and items made from his tanned skin remain on display to this day. See the top 25 crimes of the century.